Rings have always been a beautiful symbol of life's promises, commitments, and celebrations. One of the most wonderful of these is your wedding day. Everyone holds in their hearts a cherished dream of offering themselves on that special day, pure in body and spirit. You want that dream to come true; God wants it too, more than you know. 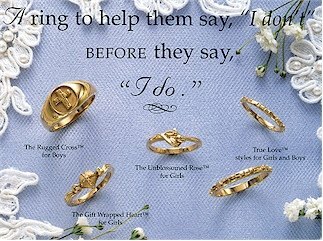 Ask Him to give you the strength to keep that promise, then symbolize it with a Chastity Ring® made of precious gold or silver, to wear until that special day when you celebrate your marriage with your spouse. are subject to and protected by copyright. Names are registered trademarks.